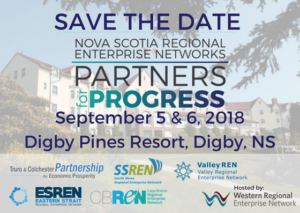 This second annual conference, Partners for Progress, will feature presentations from Nova Scotia’s six RENs on key projects being undertaken, updates from the Department of Municipal Affairs, guest speakers, and roundtable and panel discussions. We welcome you to join with members of the six RENs, government partners, and other economic development stakeholders for this conference, which begins on the evening of Sept. 5 with an opening reception, and continues on Sept. 6 from 8:30 a.m. to 4 p.m. with the conference agenda. A detailed agenda will be available soon.